The Duqm Special Economic Zone Authority (SEZAD) has granted Duqm Beach Resort a plot of land in the Duqm Special Economic Zone (SEZAD) for the development of a mixed use project, consisting of a 5 star and 4 star beach resort, an entertainment and recreation centre, residential dwellings, international school, and commercial space for a shopping centre and offices, which will be constructed on the 45 hectare site, with a total investment in excess of 500 million US dollars. The agreement was signed on behalf of SEZAD by H.E. Yahya bin Said bin Abdullah Al Jabri, Chairman of the Board of the Directors, and by Mr. Stoyan Kiceec, Chairman of the Board of Directors for Duqm Beach Touristic Resort LLC on behalf of the Duqm Beach Resort . H.E. stressed that this agreement reflects the importance of Duqm Special Economic Zone (SEZAD) on the local and international levels. H.E. Yahya bin Said bin Abdullah Al Jabri said in a press statement, that the signing of this agreement raises the number of mixed use projects in SEZAD and the size of the total investment in the zone, pointing out that this mixed use project increases competitiveness in SEZAD and provides several options for accommodation, recreation and entertainment for investors, the navies and tourists. H.E. noted that Duqm Special Economic Zone Authority is keen to diversity the platform of investments and investors, and said, “We are proud of the existence of a variety of investments in SEZAD from around the world.” H.E. also expressed his hope that this new project be a successful addition to the city centre and tourist area, and that it will contribute to providing good employment opportunities for Omani nationals. 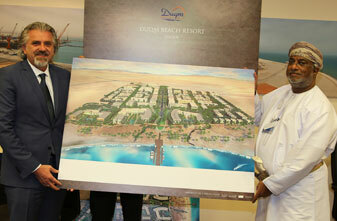 Duqm Beach Resort is an investment alliance between the Australian company Xsite Group, and Al Jazeera International. Duqm Beach Resort project includes a 5-star and a 4-star hotel, restaurants and entertainment precincts, residential dwellings, an international school and commercial space housing offices and retail stores. The first phase will be devoted to the establishment of the infrastructure for the development, tourism, and other commercial activities, along with residential units that will be constructed to meet the existing demand for affordable residential units in Duqm. The tourism project will initially start in the entertainment and recreation sector in order to target naval ships and businesses operating in SEZAD, and it is expected that the execution of the first phase of the project will commence in the last quarter of this year. It is also expected that the project will be completed within 5 years and that it shall provide 1000 jobs by 2020. For his part, Mr. Stoyan Kiceec, Duqm Beach Touristic Resort LLC Chairman, commented on the signing; “After a careful and thorough feasibility study and pre-development phase, today’s announcement demonstrates our solid commitment to develop a world-class integrated development in the Special Economic Zone in Duqm. The Xsite Group will bring its proven competencies in developing fully-established, green field master-planned communities that support the all-round economic growth of the area, in line with Sultanate of Oman Government’s objective to establish Duqm as a business and tourism hub”. Despite the agreement only having been officially formalised today, the Duqm Beach Resort has already generated serious interest from potential tenants at both national and regional levels in the residential and commercial areas, making it the perfect start for such an ambitious project. The Duqm Special Economic Zone (SEZD) provides several incentives to investors including big spaces allocated for investment, a 30-year exemption tax renewable for similar periods, 50-year usufruct agreements extendable for similar periods, in addition to many other incentives and facilities.